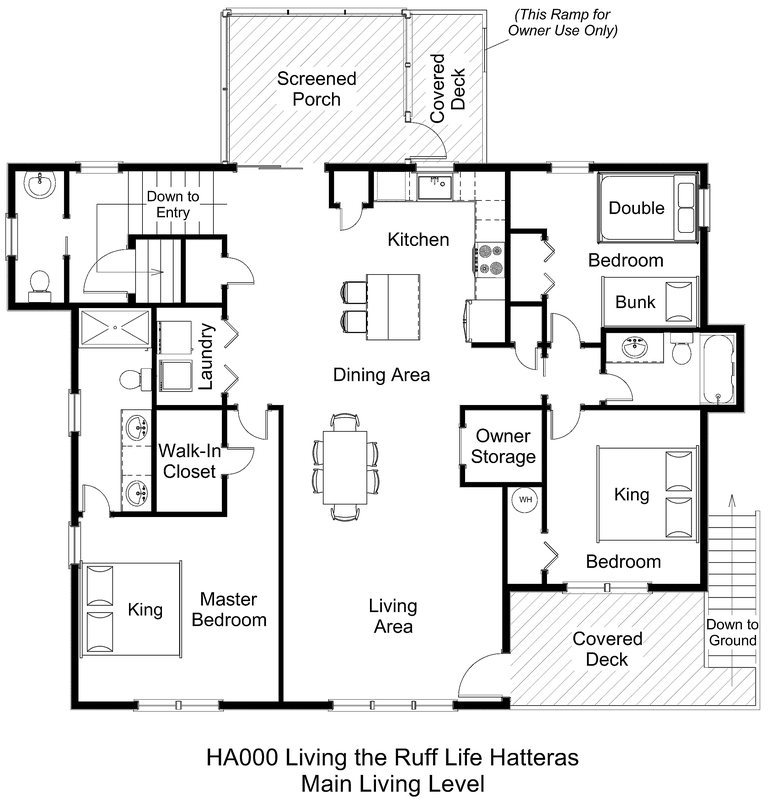 You’ll be living easy at Living the Ruff Life Hatteras! This single-level home near the north end of Hatteras Village has everything your family needs for a relaxing escape from the real world. Your pup can even get in on the fun; after all, he’s a member of the family, too. 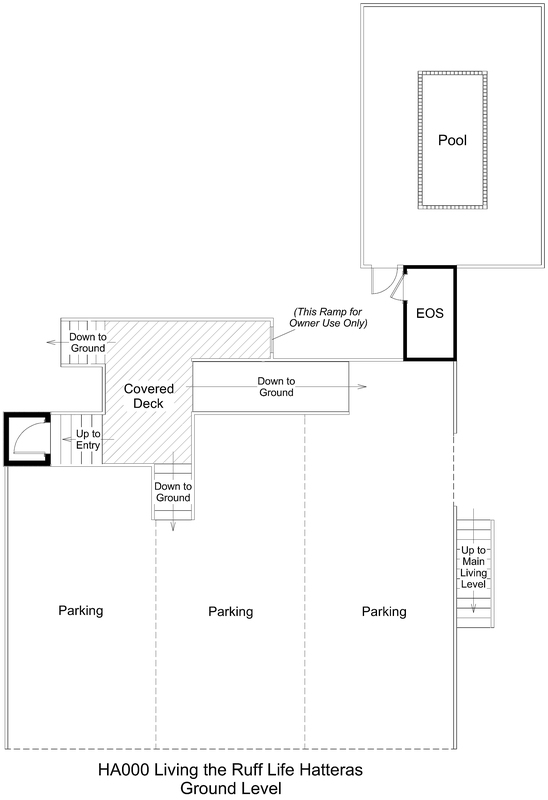 Spacious covered parking and a ramp to the entry landing make move-in a breeze. A convenient half bathroom is located right inside the under-house entry for easy access. The central living, dining, and kitchen area with breakfast bar opens onto a soundview covered deck and a breezy screened porch, perfect for taking in the salt air before a quick walk to the nearby beach. A king master bedroom with TV is off one side of the living area and features a shower stall in the private bathroom and a walk-in closet. Off the other side of the living area, a bedroom with a double and a bunk bed set shares a full bath with a second king bedroom with TV. Enjoy a dip in the private pool with available heat or head to the beach to get your toes in the sand. With all of the shops and restaurants of Hatteras Village a quick drive or bike ride away and soundside access for kayaking or paddleboarding just outside of Hatteras, adventure awaits when you book your stay in this comfortable home. Please note: Ramp along the back side of the house is locked off and not for guest use. However, the short ramp under the house is available for guest use. Is there an outside dining (picnic) table ? It appears to have plenty of outdoor seating throughout, but no outdoor dining tables. Cell service depends on your carrier. Major carriers are AT&T and Verizon. WiFi at the house is standard wireless. The location is great! Very quiet area. You can hear the waves and nature from the screened in porch, which we used a lot. The front porch has a decent view of the sound and to watch the sunrise. You can see the ocean as well! At night you can enjoy seeing Cape Hatteras Lighthouse! The pool was a huge hit with the kids and the adults even enjoyed it. There are lights for the pool area so we even swam at night. The walk to the beach was very easy and less then a 100 yards. The beach was perfect serenity! Very few people in this area of the beach, which made it even better. The house was very spacious for 4 adults and 3 kids. The area allows kids the ability to ride bike safely, as there is hardly any traffic but local residents. It seemed like more of a resident community then vacationing, but the neighbors are very friendly and quiet. Do not plan to use the road to access the sound at the point, as there are no trespassing signs posted right after the house. All in all this was an awesome home and made our beach stay pretty amazing! We would definitely stay here again!